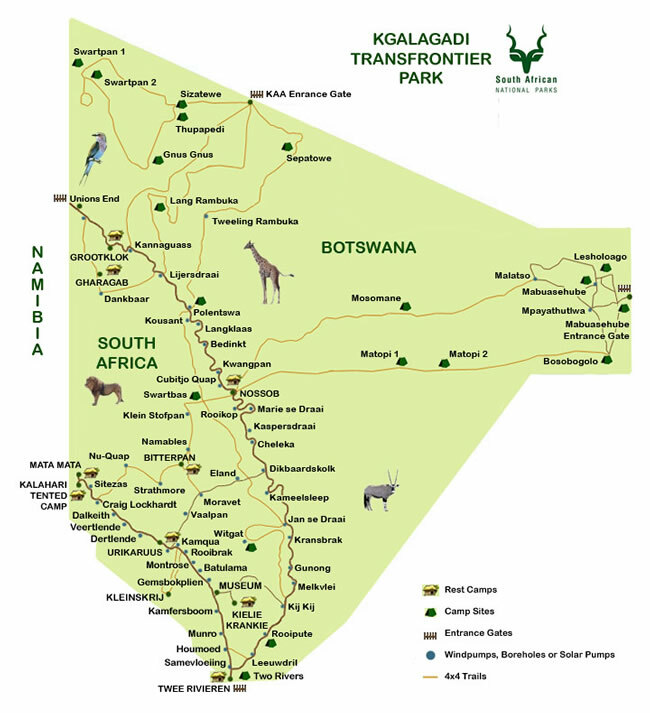 Depart from Upington to the largest camp at Twee Rivieren. En route we stop at the Khomani San. Afternoon game drive in this 37 000 square km park. Game such as gemsbok, springbok, eland, giraffe, blue wildebeest and red hartebeest roam the sparsely vegetated red sand dunes and the dry river valleys of the Nossob and Auob where a variety of acacia species thrive. The Park is well known for good sightings of lion, leopard and cheetah and spotted – and brown hyena are common residents. Because of an abundance of prey in the form of mice, whistling rats, birds and insects, smaller predators thrive in the park. The park is home to caracal, honey badger, black-backed jackal, bat-eared fox, cape fox, African wildcat, mongoose and the ever-popular suricate (meerkat). Kgalagadi is a bird watcher’s paradise with more than 300 species recorded including at least 20 larger raptor species. The world’s heaviest flying bird can be seen regularly. Optional night drive with rangers highly recommended. Game drives to search for Lion, Cheetah and Leopard, as well as the incredible antelope – and bird life of Kgalagadi. We do maximum game drives according to game reports and weather. Kgalagadi – Windhoek Early game drive in the Mata Mata area, where Giraffe can be seen. We enter Namibia at the new Mata Mata Border Post. We drive through the scenic Kalahari to the B1 near Mariental and on to Windhoek. Windhoek – Etosha National Park We depart early to enter the Park at Anderson gate in the south. The Park covers an area of 22 270 square km. Etosha Pan is 120 km long and 72 km at its widest. Four of the big five species, elephant, black rhino, lion and leopard, are in the Park. Except for the rare and endemic black-faced impala and Damara dik-dik, giraffe, red hartebeest, gemsbok, eland, kudu, cheetah, hyena and large herds of wildebeest, springbok and zebra are common. After arrival, an afternoon game drive can be done, or you can just sit and watch the wildlife activities at the waterhole at the Rest Camp. Optional night drives with rangers. Etosha Game drives according to your wishes or just relax around a waterhole. A night drive (optional) is highly recommended. Last game drive in Etosha, then we exit the Park and drive to Windhoek. End of tour. Price: Driver/guide, fuel, meals, accommodation, maximum game drives, cross-border fees. Daily conservation fee, optional night drives with rangers.